Eight clouds arise. The eightfold fence of Idzumo makes an eightfold fence for the spouses to retire [within]. Oh! that eightfold fence. (内憂外患) Troubles within, dangers without. For Westerners sympathetically acculturated to accepting radical multiculturalism, Japan offers an almost shocking vision of an alternate reality. As engaged as the Japanese are with the world through trade, diplomacy, study, and the like, they also live in a society that celebrates both its uniqueness and its segregation from the rest of the world. Perhaps some of that is natural to an island nation, but this feeling of detachment exists in a society whose wealth has come primarily from economic exchange outside its borders, and the surface of whose national life is largely indistinguishable from the modern West. When, in the mid-nineteenth century, the centuries of Tokugawa-imposed maritime restrictions were crumbling before the advance of the European imperial powers and the young United States, Japanese thinkers captured the sense of vulnerability to a world suddenly no longer safely kept outside the country’s borders. The phrase naiyū gaikan (内憂外患) circulated amongst those who wondered how long it would be before the barbarians would force their way onto Japan’s shores, and who saw that such a shock might even risk the survival of the Tokugawa shogunate, which was already struggling to maintain control of a society that had dramatically changed since the early seventeenth century. Translating roughly as “troubles within, dangers without,” the saying recognized the intimate relation between domestic and foreign policy. As a cardinal virtue of national strategy, it was accepted that a country that could not control what happened at its borders also could not control what happened within them. Even if Japan had to accommodate and drop the more restrictive maritime exclusion edicts that had defended the country for centuries, maintaining a distance from the world remained both a strategy and a national goal. In ways perhaps not fully appreciated, that tension between openness and insularity continued to influence Japanese history and government policy throughout the modern period, up to the present. In some respects, Japan appears to have enshrined a form of “exclusionary nationalism.” As used by scholars with respect to the European state-building experience, exclusionary nationalism was the means of forming modern, unified nation-states by the suppression of domestic minorities, particularly religious minorities.1 Recently, exclusionary nationalism has come to be used to explain not only ethnic conflict, but also the racist nature of some modern European rightist parties such as France’s National Front.2 But Japanese nationalism is not perfectly analogous to European nationalism. In this essay, the term “exclusionary nationalism” is used descriptively, not pejoratively, and does not imply that the current Japanese government or legal system is based on “repressive,” “racist,” or “illiberal” features (despite longstanding discrimination against Japanese of Korean descent). Yet Japan is exclusionarily nationalistic essentially by nature. When the first Europeans landed on Japan’s shores in the sixteenth century, the island nation appeared a land set apart from the rest of the world. Shrouded in clouds, its peaks glowing verdantly green, endless mysteries seemed just beyond the shoreline. Upon landing, the Portuguese missionaries and Dutch traders found a civilization almost entirely different from any they had encountered before. By the standards of the day, it was advanced, though without the technological prowess of Europe. Divided into warring feudal domains, sixteenth-century Japan was locked in the midst of a century-long civil war to determine which samurai clan would rule the rest. Armies of tens of thousands of armored warriors met in narrow plains, under the shadows of massive castles, wielding some of the deadliest weapons known to man, including the musket. When the cinders from the last battle cooled in 1600, the Tokugawa family emerged supreme. Yet far from attempting to destroy all opposition, the Tokugawa instead instituted a quasi-centralized feudal regime, allowing 250 other semiautonomous domains to carve up the country. Then, roughly forty years after taking power, they promulgated a series of edicts designed to tightly control foreign relations, making them a prerogative of the shogunate, their military bureaucracy, which served as a de facto government of the nation. These maritime exclusion edicts, restricting trade with Chinese and Dutch merchants primarily to the city of Nagasaki on the far southwestern home island of Kyushu, later gave rise to the legend of the era of isolation, the so-called sakoku or “closed country.” Only when Commodore Matthew Perry arrived with his “Black Ships” in 1853 was Japan forced to “open” itself to the world, at least in the popular Western imagination. Nearly four hundred years after the exclusion edicts were written, Japan retains the mystique of being a land apart, a country of the world but perhaps not fully in it. Some of this impression is sheer exoticization, a form of the “Orientalism” made famous (and abused) by the late Edward Said. Some of it has been used skillfully by the Japanese themselves, to deflect foreign pressure or criticism. And some of it is real, the fruit of an historical experience unique in its own ways. Though Japan has never been completely isolated from the world around it, one of Japan’s first recorded poems, in the imperial anthology Kojiki from the early eighth century, celebrated an “eightfold fence” separating Japan from other lands and peoples, a realm where the gods dwelled. Since Japan’s modern period began with the 1868 Meiji Restoration, the country has been inextricably, and at times tragically, linked with the rest of the world. In many ways, Japan remains the test case of non-Western modernization, even as it approaches the 150th anniversary of the political event that drove it to radically break with its past. Yet in the century and a half since mid-level samurai overthrew the feudal hierarchy, the country has painstakingly navigated between embracing the outer world and retaining core elements of its culture and society. As much as Japan is celebrated for becoming the first non-Western, non-Christian country to develop a modern political and economic system, it is often criticized for keeping itself closed off from other nations and cultures. While the modern Japanese state was not unified in the 1870s by the repression of foreign nationalities or ethnicities, the sense of “Japanese-ness” that accompanied modernization was nevertheless driven by a sense of exclusion of others from an already homogeneous society. Unlike in modern Europe—where ethnic groups compete not only for geographic, but also for political space—in Japan, a powerful sense of group identity serves to unify politics and society, particularly after World War II. Resistance against the state has come largely from workers’ unions and leftist parties during the first half of the twentieth century, along with a brief spasm of student-led rebellion in the 1960s, but there has been little after that. Instead, most Japanese appear to welcome both a stable political system and the physical security brought about by Japan’s exclusionary nationalism, even as they choose how and when to integrate with the surrounding world. These plaudits and criticisms have taken on particular relevance since current prime minister Shinzo Abe took office, back in late 2012. A conservative often labeled as a nationalist, Abe has moved boldly to increase Japan’s role abroad, increase its influence throughout Asia, and loosen restrictions on security cooperation that have been in place for decades. While some see Abe’s moves as designed to erase Japan’s seventy years of diplomatic and military impotence after 1945, others see him as a danger to continued peace and stability in Asia. In reality, Abe’s attempts to normalize Japan’s foreign and security policies are limited by how much internal change he and other Japanese are willing to accept. Attempts by Japan to take a leadership role in Asia, largely in response to the rapid rise of China in the past quarter century, are constrained by an equally powerful desire not to get too involved in the outer world. In other words, Japan’s role in the world remains tethered to its conceptions of “Japanese-ness” and a desire to maintain its national identity in a world of flux. It remains an open question, then, how far the Japanese people are willing to go in exercising diplomatic leadership, and accepting the burdens thereof, commensurate with their country’s still impressive economic power. Japan’s recent history forces us to consider how open borders need to be, and to judge the trade-offs societies are willing to accept between growth and opportunity. Can a country be “globalized” and “modern” yet not “open”? Japan offers an example of a society that is willing to be less engaged with the world by maintaining certain socioeconomic barriers, thereby trading some growth for physical security and economic and social stability at home. How, then, can Japan play a larger role in the world, as Prime Minister Abe wants? The triumphal post–Cold War West has lost (if it ever had) the understanding that societal openness and globalization are only a means and not an end. Victory over two existential foes in one century may have engendered a hubris that no enemy could really threaten our survival, while at the same time, the insertion and spread of a cultural and moral relativism surreptitiously took over the commanding heights of society, from universities to the mainstream media and popular culture. Japan’s different approach to both ideas goes back to its profoundly different view of modernity. In the West, ever since the American and French revolutions, modernity has been identified with the beginning of a new world, the radical reformation of reality, and the discarding of tradition. Since then, Western modernity increasingly became identified with the concept of openness to the world, moving from the realm of ideas and political philosophy to the field of economic competition, and more slowly to the social opening of the country to large-scale immigration. In reality, of course, all these strands intertwined and reinforced each other. As the belief in openness sank deep roots, it defined both national identity and government policy, particularly in America, evolving into the idea that greater diversity, achieved through ever-increasing openness, results in greater national and social strength. Driven in part by the horrors of World War II, the concept of openness formed the core of the post-1945 European reintegration, initially among the western European nations and then, after 1989, the continent as a whole. Encouraged by Washington’s Cold War global strategy, the idea eventually transcended national boundaries and evolved from a concern solely with the internal workings of a society to the idea of an integrated and united globe. Whether known as cosmopolitanism, one-worldism, or the more anodyne globalism, the idea soon became entrenched that the future lay in the effacing of national characteristics and the triumph of a managerial elite whose loyalties lay both with dispassionate science and transnational values. In Japan, by contrast, modernity and the concept of openness have always been restrained by a tradition of social stability and hierarchy that goes back to the seven centuries of a feudal system headed by shoguns and emperors. Generations of a social caste system left its impression after the abolishment of the last formal vestiges of feudalism in the mid-1870s, even as Japanese took full advantage of the freedom to choose their livelihoods, marriage partners, and places of residence. In complex ways, the social residue of those centuries persists in contemporary Japan, symbolized at its apex by the emperor. Such is one explanation both for the perplexing endurance of the imperial system and for the concomitant attention paid to news that the current emperor plans to abdicate the throne in favor of his son. The Japanese imperial clan traces its lineage back to the seventh century, making it the world’s oldest dynasty, if not monarchy. Pruned dramatically after the Second World War by the American occupying forces headed by General Douglas MacArthur, the institution remains at the spiritual core of Japan. Yet despite continued controversy over 1940s-era war guilt and the occasional divinity question, the decades of peaceful postwar history has dulled any serious opposition to its continued existence. There is no republican movement in Japan, nor calls to reduce the expenditures of the imperial family. With only three emperors in the last century, the clan quietly continues along, avoiding scandal and entering the spotlight only in the most controlled of environments. As patrons and scholars in their own right, Japan’s royals have been model constitutional monarchs, with the extended family dutifully performing their functions, much like the vast majority of their subjects. In an August 2016 television address, Emperor Akihito, now in the twenty-ninth year of his reign, made clear his desire to abdicate in favor of his son, Crown Prince Naruhito, because of his age (82) and his poor health (he has undergone heart surgery and recovered from prostate cancer). Later reports indicated that he had decided to step down on New Year’s Day 2019, and in May 2017 the cabinet approved legislation permitting the abdication, sending it to the National Diet for passage. The emperor’s announcement was carefully telegraphed beforehand, yet while shocking to many, raised no questions or doubts about the future of the imperial system. As anachronistic as the system is, it is also an indelible part of contemporary Japan: the imperial family rescued from centuries of virtual imprisonment and elevated by the Meiji Restoration of 1868 became the symbol of a modernizing nation that had overthrown 700 years of feudal rule. It is this straddling of past and present, of manufactured tradition and political impotence, of unique roles and dutiful service, which explains the perseverance of the imperial family and its near-universal acceptance by the Japanese people. The ambiguous role of the imperial family perhaps explains, or even mirrors, the continued tension in Japan between tradition and modernity. Unlike British monarchs, who touch ancient tradition primarily when crowned, Japanese emperors are surfeited with ceremonies on a near-daily basis that purport to reach back to the beginnings of the Japanese nation. Far more than other noble families, the imperial family continues in a private yet well-acknowledged capacity to intercede between their people and the gods, though like their foreign counterparts, they too cut ribbons and attend exhibitions. Such juxtapositions, extending to religious and philosophical syncretism of widely divergent systems, has long fascinated and perplexed Western observers of Japan. If aspects of premodern Japan linger in its culture, or are hidden in small villages and city side streets alike, then perhaps there is some connection with the continued existence of the imperial system. As a reminder of a premodern era—one that the Japanese often mythologize as “purer” or simpler—the imperial family plays a cultural and moral role, in a way as the conscience of a nation forever reinventing itself, at least on the surface. The self-identity of the imperial family itself is hard to pin down. Is it the ancient and sacral representative of the Japanese people, or an executive arm of the central government? The answer seems to be “yes” on both counts. Yet the restoration of the emperor as a symbol of the state was not used as an excuse to try to seal Japan off from the world of the nineteenth century. When low- and middle-ranking samurai spearheaded the overthrow of the 265-year-old Tokugawa Shogunate in 1868, they unleashed a fierce, generational battle over the path forward for Japan. The debate centered on the idea of modernity and was encapsulated in geographic terms, with proponents of reform urging “out of Asia, into Europe” (datsu-A nyu-O). This was the era of Japanese “enlightenment,” with the rapid translation of Western novels and works on politics, economics, and philosophy. Corresponding to the last half of the Victorian era, Japanese modernizers eagerly saw themselves as the vanguard of a new Asia, feeling more at home in London than in Beijing. Unsurprisingly, they were opposed, and sometimes cut down in the streets, by those fighting against westernization and the loss of traditional identities. Through those fraught decades, the Japanese government crafted images and messages that transferred supposedly ancient cultural practices and ways of living into a modern medium. The face that Japan presented both to itself and to the world deliberately merged the traditional and the avant-garde. Thus, kimono-clad maidens were pictured riding on steamships, while the Japan Tourist Bureau assured foreign visitors that they could encounter the unchanging charm of feudal Japan from the comfort of first-class railway carriages. Japanese participation in various World Fairs during the late-nineteenth and early-twentieth centuries sent the same message, an Asian twist on Henry Adams’s “The Dynamo and the Virgin,” as traditional Japanese craftsmen sat side by side with the newest mechanical equipment produced by the fledgling imperial power. Meanwhile, domestically, older forms of social hierarchy, religious practice, and cultural expression remained alongside the new, all under the somewhat stern gaze of imperial portraits hung in every schoolroom, office, and house. More so than the turning of Gallic peasants into Frenchmen during the nineteenth century, the national project of creating modern Japanese struggled with the cultural default of syncretization: of attempting to make traditional and modern coexist. If there was a moment when the imperial system was most at risk, it was in the wake of the catastrophe of World War II, known in Japan as the Pacific War. The tension between modernity and tradition that had resulted in the unprecedented emergence of Japan as a world power, and which was intensified by continued European colonialism in Asia and the ravages of the Great Depression, destroyed oligarchic control of the government, allowing ultranationalist militarists to plunge the Pacific into conflict. The death of at least four million Japanese in the war (against still-untold tens of millions in Asia more broadly), and the destruction of most of the country’s cities and industrial capacity, culminated in the atomic horror of Hiroshima and Nagasaki. After a war in which Japanese often died with the emperor’s name on their lips, it would have been tempting to tear up root and branch the inspiration for such devastation. Yet when General MacArthur landed in Japan just days after the surrender ceremony in Tokyo Bay, it was the words of Emperor Hirohito, played to the nation on a recorded disc, that ensured that the Japanese laid down their arms and accepted the occupiers. Quickly discerning in the emperor a tool to ensure compliance with American wishes, MacArthur neither forced him to abdicate nor abolished the imperial system wholesale. The resulting stain on Hirohito personally and on the position of the emperor shadowed the succeeding decades of his reign, providing fodder for other Asians and left-wing Japanese to label him a war criminal and call for the dissolution of the imperial system. No longer is the imperial family or the emperor a serious object of attack for Japan’s past actions, however. Whatever moment for radical transformation of Japan’s self-identity may have existed in the summer of 1945, it was lost during the U.S. occupation. The quiet, steady reigns of Hirohito and his son Akihito instead served as an accompanying symbolic note to Japan’s reconstruction and emergence as an economic superpower. Postwar pacifism, the fruit of an alliance between both the Left and Right, was firmly embedded in the country, but Japan’s essentially conservative social and cultural structures also remained intact, except for large-scale landowning, a victim of the occupation. Against all odds, the imperial family became identified as a fundamental element of stability anchoring a country once again rapidly modernizing. At least in Western eyes, Japan has spent the past quarter century under a cloud. After the Japanese asset price bubble popped in the late 1980s, the once and future Pacific superpower no longer interested investors, pundits, or the media. So-called Japanese models such as lifetime employment, so recently lauded, were quickly reinterpreted as rigidity, risk aversion, and a general inability to deal with a new era of innovation that valued the individual over the group. In particular, it became an article of faith in the West to decry Japan’s insularity, whether economic or sociocultural. Japanese society, ethnically monolithic and anti-immigration, was derided as fatally parochial in the modern, borderless world. Japan has found a separate existence—a separate peace, if you will—from the globalization paradigm that has dominated the West since World War II. The country’s experience over the past quarter century, since the popping of the asset and real estate bubble in 1989, raises a challenge to the fundamental question of Western modernity: how open does a modern nation need to be in order to be “successful”? The Japanese experience should prompt us to ask, in turn, whether the West has too confidently asserted the benefits of openness and globalization, and underestimated the virtues of social cohesion and stability. As one commentator recently claimed, “closed societies are meaner, poorer, and more repressive.”3 Is that really the case? Can such a claim plausibly be made about Japan? If so, what qualifies as “closed” and what as “open”? It is an almost heretical thought, but maybe Japan has made better national choices since the 1990s than we have given it credit for. It has succeeded in providing a stable and secure life for its people, despite significant economic challenges and statistical stagnation. It has done so in part by maintaining cohesion at home and certain barriers against the world. By comparison, America and Europe appear increasingly confounded by their failures to ensure sociocultural integration, keep their economies growing equally for all, and provide security in the heart of their great cities. When historians look back on global history from the 1990s into the first decades of the twenty-first century, how will they judge which nations were successful, and which failed to provide a good life for their people? The metric employed by Americans in particular—how much personal freedom and economic growth one can calculate and accumulate—is not necessarily the measure favored by the Japanese. It is fair to say that in Japan, it is not the lack of individual restraint that counts but the overall level of stability in society. Similarly, the West’s adherence to neoclassical economics has been adapted in Japan to something that may be less efficient but also less disruptive to society. The Japanese seem to have internalized the value of maintaining barriers against internal and external disruption. The assumption that openness is a prerequisite for modernity and economic success has led Western observers to dismiss, or has prevented them from understanding, the logic of an approach designed to maintain social cohesion and insulate a country from foreign economic and security disturbances. The anthropologist Edward T. Hall was one of the few Western scholars to consider the benefits of a different approach in his 1976 book Beyond Culture, when he compared “low-context,” diverse cultures like the United States, with “high-context,” more uniform cultures like Japan. Low-context cultures, which merge many disparate traditions, encourage creativity but become increasingly unwieldy the larger they grow. High-context cultures, by comparison, often impose rigidity in thinking and certainly in social interaction, but offer far greater cohesion, due largely to their monolithic ethnicity. Forty years later, the trade-offs that Hall discussed are at the center of political conflicts throughout the West. Even America, whose national identity was built on immigration, finds itself at odds over the benefits of open borders and amnesty, forming odd alliances across socioeconomic lines. For many in the United States, openness has become an end in itself, with no reference to larger social questions. The fear of unassimilated immigrants is greatest in Europe, which is now forced to contemplate the effects of decades of largely unrestrained, largely Muslim immigration that is rapidly changing the continent’s demographics while burdening its security and social services. Reassessing Japan’s recent history in the light of Western failures does not mean whitewashing its current weaknesses and challenges. A third of a century of anemic economic growth, averaging 2 percent from 1981 to 2015, is a signal that the mature Japanese economy will likely never again see double-digit growth. Unbalanced investment has left Japan’s rural regions in parlous economic shape, and temporary workers now account for nearly 40 percent of the workforce. The country’s regulatory environment is stifling, corruption nests inside corporate and political cultures, the service sector is startlingly inefficient, and the nuclear industry is a mess. The government was widely criticized for its inept handling of the March 2011 nuclear crisis after the devastating Tohoku earthquake. Socially, Japanese youth are widely reported to be dissatisfied with their future prospects, and the scope for individualism in the workplace remains tightly constricted. Foreigners are tolerated but not particularly welcomed, and Japanese of Korean descent still face discrimination. Immigration is all but absent. Moreover, Japan has faced its own homegrown terrorists, like the millennial Aum Shinrikyo cult back in the 1990s. Above all, the country faces a debilitating demographic collapse, one that no modern democracy has ever encountered and that poses the single greatest threat to Japan’s future. Yet compared with the problems that both the West and many of its neighbors face, Japan’s relative strength and stability should at least cause us to rethink our assumptions about social and economic policy. The Wall Street Journal’s Jacob Schlesinger argues that, for two decades after the popping of the bubble, Japan’s leadership consciously chose a deflationary course for the economy, seeking stability and the minimization of social risk that would accompany radical economic restructuring.4 Only the return of Shinzo Abe to the premiership in 2012 reversed this long trend, as he actively sought to inflate the economy, privileging economic expansion over stability. The difference might be thought of as “value” policy versus “growth” policy, similar to stocks or mutual funds. The careful, moderate reforms of what is called “Abenomics” indicate that even the current government is seeking a mix of value and growth, again prioritizing social stability. Despite decades of officially slow or stagnant macro growth, the real economic picture of Japan is better than many Westerners think. Writing in the Financial Times, Matthew C. Klein showed that, in the decade from 2005 to 2014, real GDP per person grew more in Japan than in the United States, Great Britain, and the eurozone.5 In the almost quarter century from 1990 to 2013, nearly the entire post-bubble era, real household consumption in Japan also grew more than in the eurozone, and behind only Great Britain, the United States, and Sweden, and without the massive rise in household debt experienced in the United States. Japan is neither sprinting ahead nor rocked by economic instability. The uncertainty that clouds so many of the world’s economies exacts psychic and material costs, but Japan, where GDP growth has been sluggish for decades, seems less threatened by the roller coaster that is prevalent in the West, in part because its system remains more resistant to radical restructuring and the diktats of unrestrained market forces. In fact, things simply aren’t all that bad. Japan remains a high-income country by Organisation for Economic Co-operation and Development (OECD) standards. Its GDP per capita at purchasing power parity rates increased from $35,779 in 2011 to $40,763 in 2015, while the cost of living in Tokyo and other major cities declined, due in part to moderate deflationary trends.6 Japan’s Gini coefficient, which measures income inequality, stood at 0.32 in 2008 (the latest year available), according to the World Bank. Though higher than many European nations, it likely remains lower than America’s 2013 measure of 0.41. Economic data tell only part of the national story. Other measures show a picture of social strength. To give just a few examples, Americans are five times as likely to be murdered as their Japanese counterparts, according to the United Nations.7 Japan, with approximately 40 percent of the population of the United States, recorded just 442 cases of intentional homicide in 2011, a rate of 0.3 per 100,000 inhabitants. Meanwhile, in America, 14,661 persons were murdered intentionally, a rate of 4.7 per 100,000. While gun control advocates point out that Japan has far more stringent gun laws than the United States, crimes of all kinds, especially violent crimes, occur far less frequently in Japan than in America. Japan is a more peaceful society because of factors other than regulation of guns. There are few debates over what it means to be “Japanese,” and different segments of society rarely seem to be at one another’s throats. Japan remains a male-dominated society, yet Japanese women are among the most highly educated in the world, and they have traditionally controlled household budgets and family decisions. Moreover, as the Financial Times’s Matthew Klein notes, more than half the growth in Japanese workers since 2003 has come from women entering the labor force, even as the overall population has shrunk. Prime Minister Abe’s “womenomics” policy seeks to increase this number even more, as well as to break the glass ceiling in executive suites. Though no one would claim that Japan is yet close to real gender equality, the trend is encouraging. Again, such statistics of social strength tell only part of a far more complex story. Yet they can be adduced to support an argument that Japan has more successfully dealt with its myriad problems over the past quarter century than most observers have recognized. Whether Japan can continue to maintain its stability, social cohesion, and basic economic strength without opening up its borders, overturning some traditional social structures, and introducing an element of disruptiveness into its culture will be the great question of Japanese history over the next two generations. Yet even to ask such questions is to again presume a Western frame of reference. Japan: In the World, but Not of It? A country as wealthy and socially stable as Japan might be expected to embrace an energetic, if not assertive, global role. On the other hand, its exclusionary nationalism may serve to dampen a wholehearted embrace of foreign adventurism. The tension between these two attitudes defines Japan’s approach to the world. Above all, it is the benign regional environment in which Japan has existed, even thrived, since 1945 that has allowed it the leisure to debate such choices, and not feel forced into one position or the other. Yet the Japanese understand well the foreign challenges they face, and their potential impact on Japan’s security and hence way of life. Not that the Japanese aren’t constantly questioning the level of their involvement in the world. “Do you think we should take in more Syrian refugees?” the head of one of Japan’s leading cultural exchange organizations asked me in November 2015 in Tokyo. “It looks like we’re not doing our part.” I demurred, noting that Europe has yet to deal with problems the refugee flood may cause. Twenty-four hours later, the Paris massacre burst onto Japan’s television screens, a reminder of the type of danger that Japan does not face. Unlike the West, consumed by the threat of terrorism for half a generation, Japan is a modernized and liberal society not directly at risk from the Islamic State, al-Qaeda, and homegrown Islamist radicals. Like any nation, it offers a plethora of soft targets, but the reality is that Japan is in comparatively little danger. Its people live in a reality entirely different from that of the West, spared from a seemingly endless fight against an implacable enemy who now lives among them. This is due in part to the fact that Japan privileges order over openness, and stability over opportunity. It is also undoubtedly due to the fact that, until now, its regional environment has been largely benign and because of the security guarantees provided to it since 1952 by the United States. That benign environment has been growing more threatening since the mid-1990s, however, thanks to China’s rapid military modernization program and assertive behavior, as well as North Korea’s continuing nuclear and ballistic missile program. That these threats emerged right at the time that Japan’s economic malaise began added another level of worry for the public and policymakers. Despite a deepening of the alliance with the United States, including two revisions to the guidelines of the alliance that increased levels of cooperation between Tokyo and Washington, doubts continue to persist in Japan over the ultimate credibility of American guarantees for their security, given the scope of the challenges and the focus of U.S. policymakers on the Middle East and other parts of the globe. percent increase from 2006. Interestingly, fully 74 percent of Chinese interviewed in the same poll believed Japanese were violent, despite seventy years of a pacifist society and constitution and essentially no Japanese military presence abroad, underscoring the trust deficit in Northeast Asia.15 Worries over Chinese encroachment in the East China Sea, not to mention North Korea’s nuclear program, are now a regular part of the national discourse, and an increasingly assertive posture towards the North Korean threat in particular has been adopted by successive Japanese governments. Over the past decade in particular, Tokyo has invested in antimissile defenses, placed orders for advanced fighter aircraft, and slowly added capabilities to project power in Asia, including through refueling tankers for fighters and building two large new helicopter carriers. Yet even with a greater awareness of foreign threats, Japan’s position in the world remains a contested issue in domestic politics, as does the larger question of Japanese nationalism and patriotism. A 2015 international Gallup poll, for example, showed that only 11 percent of Japanese would be willing to fight for their country.16 Granting that most Japanese share an instinctive desire to retain some boundaries against the rest of the world, the debate, then, is over the degree to which Japan should engage so as not to put at risk its natural separateness. It is here that current prime minister Shinzo Abe’s bold foreign policies are so controversial. Abe returned to office in late 2012, determined to continue where he ignominiously left off in 2007. He quickly dusted off plans to increase the military budget, form a National Security Secretariat, end the restrictions on arms exports and defense industry cooperation, and pursue enhanced relations with a number of strategic countries like India and Australia. Most notably, he submitted to the National Diet a bill to allow for the exercise of collective self-defense, so as to deepen security cooperation with the United States and other potential partners. At nearly the same time, Abe was negotiating with the Obama administration on a set of revised guidelines for the U.S.-Japan alliance, designed to enhance security cooperation and embrace new areas such as cyber and space. From the beginning, both the security bill and the revised guidelines drew heavy criticism from the opposition party and domestic groups. Consistent majorities opposed Abe’s plans to allow Japan to more easily dispatch forces abroad. For example, in July 2015, just as the lower house of the Diet was poised to pass the bill, 57 percent of those polled by the Asahi Shimbun were opposed to Abe’s security bills allowing Japan to participate in collective self-defense activities.17 These numbers held steady throughout the period of the legislation’s debate and passage, ultimately ending in September 2015, when the upper house assented to the bills. As the votes were set to begin, tens of thousands of protesters filled the streets near the Diet building, with grey-haired veterans of Japan’s pacifist movements joined by students in their 20s, who had no experience of Japan’s wartime past.18 As always, a large proportion of left-wing teachers’ groups joined the protests. In response, scholars such as Keio University’s Yoshihide Soeya have argued that Japan must pursue a “middle power” strategy that acknowledges its gross power limitations.21 Specifically, Soeya believes, Tokyo must embrace a “middle power internationalism” that seeks to maximize Japan’s diplomacy and participation in multilateral fora and embed itself in a community of similar middle powers balancing off the demands of the United States and China. Suggestions such as these seek to counter a perceived trend towards “regressive nationalism,” in Soeya’s words. The belief that the cork needs to remain in the bottle of Japanese militarism more than seventy years after the end of the World War II highlights just how strongly Japan’s past continues to shape current views. By contrast, Japanese policymakers cannot shirk their responsibility to prepare to meet the threats they perceive to national security. Public opinion polls and scholarly arguments such as those above point out the gulf between Japan’s elected leaders and its population. As Soeya acknowledges, leaders from both major Japanese political parties, the Liberal Democrats and the Democratic Party (DPJ), have embraced an expansionist role for Japan’s diplomacy and security policies over the past decade. It was DPJ premier Yoshihiko Noda, for example, who publicly embraced revising the restrictions on collective self-defense, keeping alive a policy preference from the first Abe administration in 2006–7. Moreover, Noda made the decision to purchase the F-35 Joint Strike Fighter and to reorient Japan’s security strategy to focus explicitly on defending the Senkaku and other southwestern islands. Though his policies have gone further and are more controversial, Abe is no outlier among Japanese policymakers. Rather, he is pushing to a logical conclusion the modernization in Japan’s security and foreign policies that began in earnest in 1998, with the first North Korean Taepodong ballistic missile launch over Japanese territory. Perhaps the ultimate endpoint of Abe’s attempts to broaden Japan’s role in the world is the most symbolic: the revision of the country’s postwar constitution. Written over a matter of weeks by the American occupying force in 1946, the constitution was promulgated the following year, including its famous Article 9, forever renouncing “war as a sovereign right of the nation and the threat or use of force as means of settling international disputes.” Despite the corollary abjuration of maintaining “land, sea, and air forces, as well as other war potential,” the Japanese Self-Defense Forces have nonetheless developed into one of the world’s most capable militaries, underscoring the incompatibility between the nation’s fundamental political document and the reality required for self-defense. Article 9 is perhaps the single most controversial political issue in postwar Japan, decried by conservatives who question the double standard that seeks to limit Japan’s sovereign right to maintain both a military and act in its self-interest, and celebrated by liberals who see it as the apotheosis of modern Japan’s penance for the aggression and atrocities of the Pacific War era. While the article has done little to prevent Japan from maintaining a modern, effective military, it has left the issue of the legitimacy of Japan’s military and security policies in limbo. The fact that the American alliance guarantee helped avoid addressing the inconsistency head on only led to a hardening of opinion on both sides of the domestic debate, with neither having to consider the real-world effect of either maintaining or abandoning Article 9. Even if Abe is successful in revising the constitution, both Japanese political culture and public opinion will continue to place limits on Tokyo’s global engagement and security policies. Adventurism of the kind that marks Chinese expansion in the South China Sea, Russia’s annexation of Crimea, or America’s various battles around the globe are almost inconceivable for the foreseeable future. Moreover, absent a true crisis of confidence in the U.S.-Japan alliance, it is highly unlikely to impossible that Tokyo would pursue an indigenous nuclear weapons capability in the near term. The country is even unlikely to develop offensive strike capabilities such as ballistic missiles, despite the fact that its air and naval forces are becoming increasingly able to project limited amounts of power outside the home islands. Nor is there any real prospect of remaining restrictions on the deployment of Japanese forces abroad being lifted, especially for combat roles. Japan instead is far more likely to take a middle path, improving its high-end defensive capabilities and modernizing its forces, while maintaining political limits on what those forces can do. It is poised to export modest amounts of defense materials abroad and engage in limited codevelopment and coproduction of armaments and assembly of major systems, such as the F-35 fighter. As for Japan’s security relationships, its alliance with the United States will remain at the center of its security planning for the foreseeable future, with both Japanese policymakers and the public assuming that U.S. forces will be the ultimate guarantor of the country’s security in the case of a major conflict with China or North Korea. Beyond that, future leaders who share Abe’s vision likely will try to enhance relationships with key nations, including Australia and India, perhaps by joining in larger military drills and training. Meanwhile, they will also ensure that smaller nations in Southeast Asia view Japan as a supplier of armaments. Doing so will indeed make Japan one of the more active regional actors in an Asia dominated by smaller and less developed nations. But Tokyo is unlikely to desire or to sign any more mutual defense treaties, or to commit its forces in combat abroad. Even providing more public goods, such as conducting freedom of navigation operations in the South China Sea, will be difficult for a risk-averse government, as well as for a society that strongly distinguishes itself from the rest of the world. A still-strong sense of being a country apart, a desire to maintain domestic social and political stability, and a wariness of draining national wealth on overseas interventions will continue to demarcate the limits of Japan’s engagement with the world. As it has from time immemorial, the eightfold fence continues to ring, and to protect, the islands of Japan. 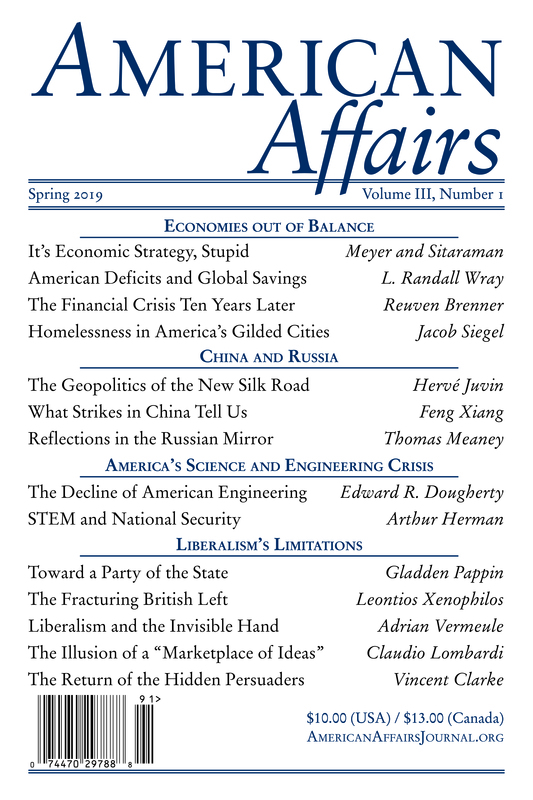 This article originally appeared in American Affairs Volume I, Number 3 (Fall 2017): 109–31. This essay was written while the author was a resident scholar at the American Enterprise Institute. Parts of this essay were adapted from articles published by Politico and Standpoint. 1See, for example, Anthony W. Marx, Faith in Nation: Exclusionary Origins of Nationalism (New York: Oxford University Press, 2003). 2 Paul Collier, “How to Save Capitalism from Itself,” Times Literary Supplement, January 25, 2017, http://www.the-tls.co.uk/articles/public/how-to-save-capitalism/. 3 Philip Stephens, “Peace and Prosperity: It Is Worth Saving the Liberal Order,” Financial Times, February 9, 2017, https://www.ft.com/content/b2db707e-ed61-11e6-ba01-119a44939bb6. 4 Jacob M. Schlesinger, “Japan’s Economic Dilemma: Comfortable Decline or Painful Revival?,” Wall Street Journal, December 3, 2014, https://www.wsj.com/articles/japans-economic-dilemma-comfortable-decline-or-painful-revival-1417640405. 5 Matthew C. Klein, “Did Japan Actually Lose Any Decades?,” Financial Times, December 4, 2014, https://ftalphaville.ft.com/2014/12/04/2059371/did-japan-actually-lose-any-decades/. 6 World Bank, World Development Indicators, June 2017, http://data.worldbank.org/data-catalog/world-development-indicators. 7 United Nations Office on Drugs and Crime (UNODC), Global Study on Homicide 2013 (Herndon, Va.: UN Publications, 2013), https://www.unodc.org/documents/gsh/pdfs/2014_GLOBAL_HOMICIDE_BOOK_web.pdf. 8 OECD, Pisa 2015 Results, vol. 1, Excellence and Equity in Education (Paris: OECD Publishing, 2016). The previous results, with Japan scoring at the top, can be found at Organisation for Economic Co-operation and Development (OECD), Japan—Country Note—Results from PISA 2012 (Paris: OECD Publishing, 2012). 10 OECD, “Employment Rate: Aged 15–74: All Persons for Japan,” Federal Reserve Bank of St. Louis, https://fred.stlouisfed.org/series/LREM74TTJPM156S; “Labor Force Statistics from the Current Population Survey,” Bureau of Labor Statistics, accessed April 20, 2017, https://data.bls.gov/timeseries/LNS11300000. 11 OECD, “Obesity Update 2017” (Paris: OECD Publishing, 2017), http://www.oecd.org/health/health-systems/Obesity-Update-2017.pdf. 12 “Data for Cancer Frequency by Country,” World Cancer Research Fund International, accessed July 18, 2017, http://www.wcrf.org/int/cancer-facts-figures/data-cancer-frequency-country. 13 AIDS Surveillance Committee, “Report to UNAIDS—HIV/AIDS Trends in Japan,” April 2016, http://www.unaids.org/sites/default/files/country/documents/JPN_narrative_report_2016.pdf; “HIV in the United States: At a Glance,” Centers for Disease Control and Prevention, https://www.cdc.gov/hiv/statistics/overview/ataglance.html. 14 Tomoko Otake, “Suicides Down, but Japan Still Second Highest among Major Industrialized Nations, Report Says,” Japan Times, May 30, 2017, http://www.japantimes.co.jp/news/2017/05/30/national/social-issues/preventive-efforts-seen-helping-2016-saw-another-decline-suicides-japan-21897/. 15 “Hostile Neighbors: China vs. Japan,” Pew Research Center, September 13, 2016, http://www.pewglobal.org/2016/09/13/hostile-neighbors-china-vs-japan/. 16 “Only 11% of Japanese People Willing to Fight for Their Country: Gallup survey,” Japan Today, November 23, 2015, https://japantoday.com/category/national/only-11-of-japanese-people-willing-to-fight-for-their-country-gallup-survey. 17 “Asahi Shimbun Public Opinion Poll (07/19/2015),” The Maureen and Mike Mansfield Foundation, July 19, 2015, http://mansfieldfdn.org/program/research-education-and-communication/asian-opinion-poll-database/asahi-shimbun-public-opinion-poll/. 18 Linda Sieg, “Japan Protesters Rally as Contentious Security Bills Near Passage,” Reuters, September 16, 2015, http://www.reuters.com/article/us-japan-security-idUSKCN0RG0DZ20150916. 19 “Nearly Half of Japanese Oppose New Joint Defense Guidelines with US: Poll,” Japan Times, April 30, 2015, http://www.japantimes.co.jp/news/2015/04/30/national/politics-diplomacy/nearly-half-of-japanese-oppose-new-joint-defense-guidelines-with-u-s-poll/. 20 “Poll Finds Trans-Pacific Gap on Role Japan Should Play in Region,” Japan Times, April 8, 2015, http://www.japantimes.co.jp/news/2015/04/08/national/big-japan-u-s-opinion-gap-over-a-bombings-poll/. 21 Yoshihide Soeya, “Japanese Middle-Power Diplomacy,” East Asia Forum, November 22, 2012, http://www.eastasiaforum.org/2012/11/22/japanese-middle-power-diplomacy/. 22 See “改憲「時期こだわらず」52% 朝日新聞5月世論調査,” Asahi Shimbun, May 16, 2017, http://www.asahi.com/articles/ASK5H4PPDK5HUZPS002.html; see also “憲法９条に自衛隊明記「賛成」51%　本社世論調査 新憲法の2020年施行目標、「賛成」43%「反対」39%,” Nihon Keizai Shimbun, May 28, 2017, http://www.nikkei.com/article/DGXLASFS28H2N_Y7A520C1MM8000/. Michael Auslin is the Williams-Griffis Fellow in Contemporary Asia at the Hoover Institution, Stanford University.